The stock which had been squirreled away to all kinds of places for safe keeping will soon be to hand. As you can see I have managed to start the jewellery collections and soon I will have all the wonderful goodies listed I am known for. I have many beautiful garments and accessories in the archives dating from Victorian to the 1970s, but I have a particular penchant for the 1940s and they will soon be ready to list. As many of you know, if you cannot see what it is your looking for you just need to contact me especially the brides. For the new customers who were not fortunate enough to visit my shop in Notting Hill Gate in London, I have thirty five years of vintage experience to call upon and this reflects in my collections. I am known for my exquisite bridal and evening wear, but of course I do have an eclectic range of clothing, accessories, jewellery and haberdashery for everyone including children. The photographs I have been sent of the many happy brides and grooms I, my daughter Lucy and my assistants have dressed are second to none. My shop in Notting Hill Gate was also frequented by many famous people and I have inspired many top designers. Everyday we would have a costume designer looking for items and advice for films, tv and theatre and I miss it all so much! The area was full of very stylish, crazy and eccentric people and I fitted in very well. I will write a book on my experiences one of these days, but lets get selling first! 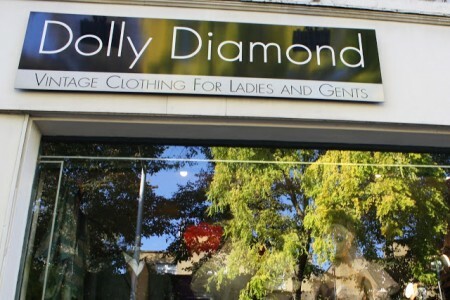 ‘Dolly Diamond’ – is that my real name? people would always ask, it is indeed, and no other name would have been more appropriate for a shop with such glamorous stock for such glamorous customers. I managed to turn what was once a hobby into a very successful business, concentrating on buying the most exquisite vintage pieces for the business (and of course for my private collection -hm!) I suppose I will have to sell some of that now I am down here in the sticks, although my little grand daughter awaits in the wings for a time when she will have first pickings, actually she already does.